Jamica sent me their latest family portrait to share with you. It was taken last fall. This is a column that I wrote for The Barrow Journal. 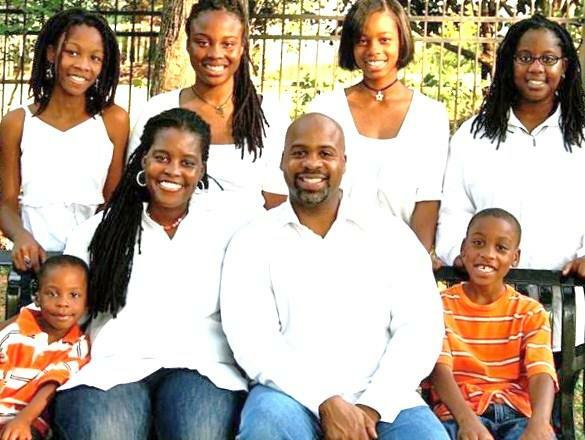 The Bell family is a great example of a homeschooling family where homeschooling has or is benefitting all the children. Click here to read my column. After writing the column, I realized that Jamica Bell wrote a lot of valuable information that I just couldn’t fit into the column. So, for a special addition to my blog, I’m going to post the script of our interview. I have only edited it a little for clarity. I hope you enjoy reading it as much as I enjoyed learning about this hip homeschooling family! Please note that Jamica has answered all the questions except for numbers 10 and 11 where I have noted that her daughter, Nia, answers. 1. What are the names/ages of your children? 2. How long have you been homeschooling? Have any of your kids ever attended any regular school? I have been homeschooling for about 14 years. Eshantee and Nia began their school career in preschool and first grade at a private Christian academy. 3. What made you decide that you wanted to homeschool? Have you been happy with the decision? Though my family enjoyed an excellent experience at the Christian academy they attended, I was very impressed with how open and earnest my daughters were to learn everything I wanted to teach them. During their first summer vacation, they wanted to know all sorts of things, like how to make biscuits, what made the sky blue but the clouds white, why were kids mean to some children but nice to others, and the list goes on and on. It dawned on me just how precious the time we had together truly was. In just a few short weeks, we would no longer be able to spend our days learning about the world around us together. I wanted more of this very valuable time and determined I did not want to share the fleeting years of my children’s youth with anyone else. With only so many waking hours in a day, why should I give away my children’s best moments to someone else? That’s why we made the decision to homeschool. My family and I have been extremely happy with our decision. We have all learned so much about one another and the world around us. It is awesome to watch a child develop into the wonderful adult they will one day become. 4. What style of homeschooling would you classify yourself as? Do you have a philosophy about homeschooling? A) I would classify myself as an eclectic homeschooler. I don’t believe in putting my students or myself in a box when it comes to education. I believe in stimulating all the senses when learning a new subject and expounding on learned subjects. If one of my students prefers a firm structure and curriculum, we find ways to accommodate that preference (i.e. online curriculum or distance learning). However, that same student may be asked to research and plan a cultural family celebration, complete with food, music, art, etc. One year my daughter Nia organized a fabulous Hawaiian Heritage celebration for our family (great grandmother was Hawaiian). We experienced an authentic meal, language, music, and dance while learning about our family in a nontraditional way. The student was also able to stretch her imagination as well as try other learning styles. This simply means that whatever route a parent chooses to take to provide that most excellent education is up to that parent. Whether it is homeschool, private or public, the parent can make this experience as rich as they would like. The possibilities and options are limitless. If their child is interested in aviation, the parent could watch videos, build model planes, or even schedule a flight in a charter plane. In my opinion, at the end of the day, the parents’ commitment to excellence is what matters most. 5. What kinds of tools or curriculum do you use to homeschool? Though I am not committed to one particular curriculum, I do utilize pieces from several. Usborne books are very helpful. Interactive online courses are used as well. One of my favorite websites is Edhelper.com. I have used it for years and am able to find multidiscipline worksheets on nearly any subject of interest. I also love the Bob Books for beginner readers. 6. Are you the primary “teacher” or does your spouse get involved with the homeschooling? My husband and I share teaching responsibilities. My teenagers also participate in teaching at times. 7. What made you want to start the Barrow County Homeschooling group? Can you tell us a little about it? Actually, my teenagers came up with the idea of starting a group in our own county. After living in Barrow County for nearly 6 years, it was not uncommon for us to travel to surrounding counties for basic activities like park days, teen socials, etc. Eventually, we stopped trying to attend events because of the distance. As you can imagine, it left everyone feeling pretty isolated. So we thought, “If we are experiencing this type of isolation, maybe there are others in this county who are experiencing the same thing.” It just seemed a little absurd to not have something for the Barrow County homeschooling community, by the Barrow County homeschooling community. The rest is history. We have been so surprised at just how many families were feeling the exact same way we were all this time. 8. What do you love the most about homeschooling, and what do you like the least about it? A) What I love most about homeschooling is the liberty to explore limitless educational possibilities and experiences. Considering the fact that life is a learning experience, we get to make the journey as rich and rewarding as we want. I also love the way my children think. They have the freedom to be themselves and actually be appreciated for that. In return, they are able to freely appreciate the uniqueness in others. B) What I like least about homeschooling is the stereotypes we come up against. Perhaps, based on the media, a biased article, or a negative personal experience, there are so many people who think they know who we are and what we do. Unfortunately, we all get painted with the same brush. It only takes the witness of one marvelous homeschooling moment or encounter to change the mind of an individual. I hope we are able to provide such encounters, one individual at a time. 9. I believe your eldest daughter has already graduated high school and is in college, correct? What did you do to ensure that she would be eligible to attend college? Was it easy for her to enter college as a homeschooler? My eldest daughter is a wife, mother, and business owner. However, my second eldest daughter, Nia, has graduated and is enrolled at Georgia Gwinnett College in Lawrenceville, Georgia. By determining the graduation requirements for Georgia, we were able to cater her education accordingly. However, she decided to complete her GED to ensure her admittance into college would go as smoothly as possible. It was very easy for her to enter into college as a homeschooler. There was no stress whatsoever. We were able to provide any information they requested. She aced her entrance exam and is starting this summer. 10. Can you tell us what she’s studying now, and what her plans are for the future? Nia answers: I am currently in college to earn a B.A. in general business. Afterwards, it is my intention to earn a Master of Science degree in game production and management. I have always wanted to be an entrepreneur and general business seemed a good route to go. As a child, I’ve always had an overactive imagination and a love for storytelling, but sadly, no talent for writing. As video games have always been one of my greatest passions, I want to use video game production as a medium to exercise my imagination. 11. Can your daughter tell me what she thinks about having been homeschooled? Now that she’s in college, does she see the benefit of being homeschooled or any negatives about it? Nia answers: On being home schooled, I have nothing but the highest praise. Being home schooled is like raising a plant indoors, and then transplanting it outdoors in spring. When plants are raised indoors, they are protected from wilting sun, choking weeds, and dire diseases until they are strong enough to withstand the elements on their own. Oftentimes, these plants do better than their outdoor counterparts. My home-education allowed me to learn who I was and who I wanted to be without the burden of my peers pressuring me in any other direction. It also allowed me the freedom to bond with my family and avoid the typical teenage drawback that often damages those relationships irreparably. I have had the occasion to interact with my publicly and privately educated counterparts. The only negative that I could possibly see is if a parent-teacher is inattentive and neglects to take their child’s education seriously, or if they refuse to see the importance of socialization for their child’s healthy growth. These errors result in an unhappy, poorly educated, maladjusted outcast that resents her parents and falls into peer pressure easily. I have seen this type of homeschooling and must admit that this is what a lot of people expect when they hear the word “homeschoolers”. But providing that those pitfalls are avoided, I believe homeschooling can provide a child with the self-confidence, coping skills and academic understanding to reach their full potential. 12. Is there anything you would like to add? Jamica again: One of my most successful school years has been this past year. I have my Barrow County Homeschoolers (BCH) family to thank for that. Forming BCH has allowed my entire family to establish lasting friendships and it has enriched our lives in such a tremendous way. It is an excellent thing to see just how well children can blossom socially, psychologically, and educationally when they are planted in a socially accepting and nurturing environment. Ideally, this is why most homeschool families join homeschool support groups. For other interviews with homeschoolers, be sure to click on the “Interviews with Homeschoolers” tab in the menu.